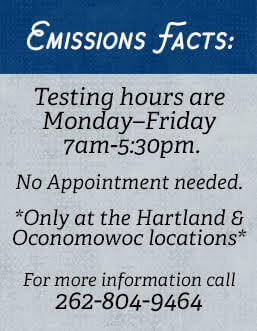 Has the Wisconsin Department of Transportation (WisDOT) notified you that your vehicle is due for emissions testing? Don’t worry, you can simply bring your car, truck, SUV, minivan or crossover to Silver Lake Auto & Tire Centers for fast, reliable emissions testing in Hartland and Oconomowoc, WI! We are a Certified Wisconsin Emissions Test Station and are happy to help you with all of your emissions testing, emissions repairs and state inspections. It’s important to get these auto services completed right away to ensure that your motor vehicle is in good standings and legal to operate. How Do I know if My Car Needs Emissions Testing in Wisconsin? When your vehicle is due to be tested, the Wisconsin Department of Transportation will notify you. They will make a notification about it in the vehicle registration renewal notices they send out in the mail, as well as any time the vehicle changes ownership. When Are Emissions Tests Required? Emissions tests are required at some regular occasions, such as when a vehicle changes ownership, and some non-regular occasions, as designated by the WisDOT. Most vehicles kept in one of the seven southeastern Wisconsin counties of Kenosha, Milwaukee, Ozaukee, Racine, Sheboygan, Washington and Waukesha are subject to needing regular emissions testing every few years. Before renewing registration every 2 years (with the first time occurring 3 years after the car was manufactured). After first registering a vehicle in Wisconsin. After transferring ownership of a vehicle (anytime there is a transfer of license plates or new license plates are issued). Why Do I Have to Get A Vehicle Emission Inspection? Regular emissions tests are mandated by the federal Clean Air Act, which requires vehicle emission inspections and maintenance programs in areas across the country with significant air quality issues. Southeastern Wisconsin falls into that category. Automobiles produce a lot of air pollutants, as exhaust contains carbon monoxide, nitrogen oxides and other harmful elements. Keeping the exhaust and emissions outputs of our cars lower has helped make great improvements in our air quality, which is important for preserving our environment for future generations!